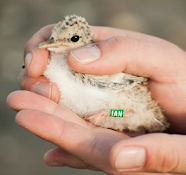 A pioneering Little Tern, the first of the year at Kilcoole was noted on 18th April (Ian Stevenson per. IrishBirding). Over the next 10 days more reports came in right around the coast from Louth to Galway so I decided to pop down to Kilcoole last Friday (27th April) for a general look around & to see if any more birds had arrived. I always like to get a feel for the site in advance of the project season (which starts this week). Whilst strolling along the coast towards the main breeding location (known as the 'K-colony') the distinctive sound of a Little Tern rang through my ears for the first time in 8 months, but I couldn't see it! Perhaps my wardening skills were rusty after the winter break? A short while later I was standing at the K-colony with my neck cranked backwards, staring up in awe at a pair of terns in full display flight, wheeling around with incredible speed. All the while a second courting pair were present nearby in The Breaches, themselves holding their heads back, necks fully stretched & wings lowered, seemingly mocking me with their posture. The state of the beach was less heart warming however. Strong North Easterlies lashed the coast in recent weeks which, in conjunction with some high tides have re-profiled the beach such that the overall height is much lower than would be desirable, potentially reducing the amount of available 'safe' nesting habitat from future extreme weather events. Several years worth of dried seaweed & encroaching maritime vegetation have also been cleared back right up to the sand dunes making the beach much more open...easier for wardens to keep a watchful eye on nesting terns but perhaps also for predators to spot eggs & chicks! I'd like to think I'm being overly pessimistic here but in any case we should all hope for settled weather this summer for the sake of the birds! Heavy rain has resulted in higher water levels than expected for the time of year on the coastal marshes at Kilcoole. As such, there was some excellent numbers of Spring migrant waders present on Friday: 64 Whimbrel, 206 Black-tailed Godwits, 43 Golden Plover, 42 Oystercatchers, 89 Dunlin, 32 Ringed Plover, 19 Turnstone, 7 Curlew, 2 Redshank, 7 Bar-tailed Godwits & 4 Common Sandpipers were all counted on the NPWS reserve (known as 'Webb's Field') alone. Between 10-12 pairs of Lapwing are breeding here also, some of which already have small chicks. A rather encouraging increase on previous years tallies so far. Other species of interest on the marsh included 18 Shelduck, 5 Teal, 3 Wigeon, a male Shoveler, 4 Light-bellied Brent Geese, 4 Little Egrets, 19 Great Black-backed Gulls, a Stock Dove & a singing male Stonechat. A Swift was seen overhead, 22 Swallows & 4 Sandwich Terns migrated North and a female Kestrel was showing well, hunting along the dunes.